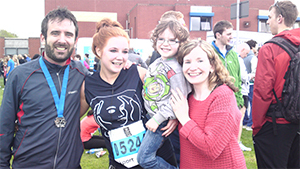 Despite injuries and air strikes, Paul Rice has completed two marathons to raise money for the Miscarriage Association: the Belfast Marathon in May 2013 and the Dublin Marathon in October 2014. In October he sent us the message below, along with the picture of him with his sister (Treasa), son (Patrick) and wife (Jane) after the Belfast Marathon. “I did it, just about. Had to walk the last five miles as my foot gave out but got round in 4:36ish. It was freakishly warm in Dublin yesterday, 20 degrees, so it was a real struggle. Great atmosphere though and really delighted to have finished. Will be hanging up the running shoes for a good few months now!